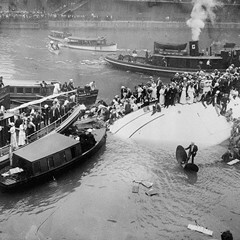 Passengers wait for help after the Eastland capsized in the Chicago River on July 24, 1915. More than 800 others didn't make it out alive. 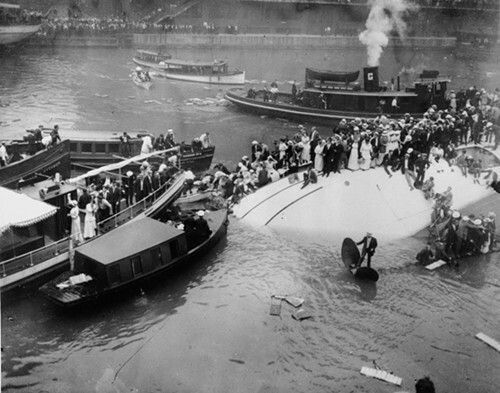 It happened in plain view—at 7:30 AM in the middle of a city—but the SS Eastland disaster has long been unfathomable. How did a 260-foot-long steamship simply tip over while docked in the Chicago River? A century ago this summer—on July 24, 1915—more than 2,500 passengers boarded the vessel near the Clark Street Bridge for a day trip from Chicago to Michigan City, Indiana. The Western Electric company was sponsoring the outing as a gift to its employees and their families, but before it even left port the ship spilled onto its side. Though the ship was only a few yards from shore, 844 people ended up dying, most from drowning. Images of the capsized Eastland were back in the news earlier this year when two separate film clips were unearthed by graduate students at UIC and Northern Illinois University, renewing a discussion about what led to the catastrophe. The long-standing theory was that the ship was weighed down by too many lifeboats, the result of new regulations put in place after the sinking of the Titanic three years earlier. But that never added up for author and journalist Michael McCarthy, who started digging deeper. After years of research, he reached a much different conclusion: the owners of the Eastland knew it wasn't seaworthy but set aside their safety concerns to make money. I recently sat down with McCarthy, a former reporter and editor in Chicago for the Wall Street Journal, to talk about his fascinating new book, Ashes Under Water: The SS Eastland and the Shipwreck That Shook America (Lyons Press). MD: How did you get drawn into this story? Mike McCarthy: Sometime around early 2000, a friend of mine mentioned, as we were having dinner near the Chicago River, "You know, right here a ship turned over and more people died than on the Titanic. 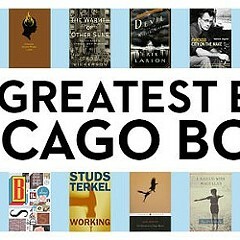 "* I had never heard about it, and I'd worked in Chicago off and on for 15 years. I said, "That can't be right." I was so struck by this idea. How could that have happened, and how could no one have been found responsible? Those two things were just driving me crazy. So I started to do research, and early on I came across files in the National Archives from the court case, when [the federal government] tried to bring charges against the crew, the inspectors, and the shipowners. During that trial there were exhibits that showed that the owners knew there were mechanical problems with the boat and they planned to repair it. Part of me, journalistically, wanted to set the record straight: there was a far more sinister reason for this than nameless, anonymous regulations. There were actually business people with names who did very evil things and then got away with them by hiring fancy attorneys to get them off. Let's take a step back and look at the landscape in 1915. This was an era when the industrial Great Lakes region was on the upswing—the cargo and passenger ship industries were booming, and for a while shipbuilders couldn't keep up with demand. Steamships had come in as passenger vehicles, and the car wasn't there yet. 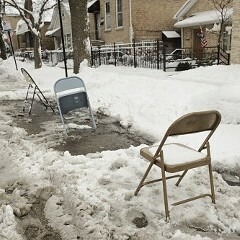 People were living in a vast, sweltering Chicago and saying, "I want a refreshing summer day—what can I do?" So they go out on the lake. Up pops this steamship industry that also is running cargo back and forth, like fruit from the fields of Michigan. One way to think about it was that people wanted to live like the rich, and this was a little touch of being prosperous. It was a carnival atmosphere on the boats. The Eastland had a whooping calliope, a little gambling, a belly dancer. We're also talking about an era when the city was growing very rapidly, and a lot of workers were low-paid, first- or second-generation immigrants. This is just nine years after Upton Sinclair's The Jungle described unthinkable working conditions in the stockyards. A company junket on a steamship had to be a big deal. It was. Western Electric was part of a progressive employer movement where they were trying to reduce hours, they were trying to come up with training and education for their workers, and the company picnic was another thing. But at the same time, you have the Eastland's operating company, which was cruelly apathetic toward the passengers they were taking on. I don't know anything about shipbuilding, but the notion that a ship could just capsize is mind-boggling. How could we have a ship that gets into a situation—and it's not even high seas or anything—where it just tips over? This was just a poorly designed ship. It was from a shipyard that had never built passenger ships before—the Eastland was the first one they built, and it was the last one they built. The architect who built it was in above his head, didn't know what he was doing, and went back to his professor at Cornell several times [for help]. The ship had a ballast system that was supposed to stabilize it to counteract unwanted rolling. It worked most of the time, but when it didn't work, it was abysmal. The Eastland was going to capsize at some point—there's no question. And as you point out, the ship nearly did capsize on at least two previous occasions. Yes. One was in 1903 outside South Haven, Michigan, and one was in 1907 outside Cleveland. One of the people aboard that trip was so afraid that he took a train back home to port. And something else happened in 1914—some kind of accident. The Eastland missed two critical weeks right in the middle of the season, around the Fourth of July, for repairs. What we learn [from court records] is that afterward one of the officers of the company started asking questions about repairing the stability of the ship. And they decided to postpone them. This is where the really heartless side of this is: basically they say, "Let's not hold up ticket revenues." Following the tragedy, the federal government tried to prosecute the shipowners and some of the crew, including the chief engineer, Joseph Erickson, who was initially the scapegoat. But all of them—even the owners—ended up getting off, thanks in large part to attorney Clarence Darrow. He would go on to fame as a defender of the underdog, but I don't think you like Darrow very much. I think he was an exceptional attorney and I think he won the case for his man, which is great—I'm delighted Erickson was not found guilty of something he didn't do. But it's also hard for me to feel fully satisfied that justice was done when people who were responsible were exonerated as well. I wish it were more of a Hollywood movie, but this is reality: the good guy got off and so did the bad guys. I think it was one of the great injustices of the 20th century. * Clarification: As McCarthy notes in his book, more passengers died when the Eastland capsized—844 to 832—though the total number of deaths, including crew, exceeded 1,500 from the Titanic sinking. Did you read about dibs, Adnan Syed, and psychedelic drugs? 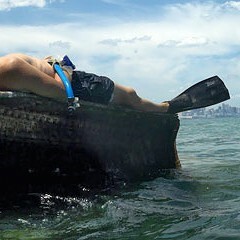 The shipwreck of the Silver Spray has rested a stone's throw from the Hyde Park shoreline for nearly 100 years—but it may not be around for much longer.